In May of last year, I was slowly coming down out of a caffeine-induced psychotic break of sorts, desperately trying to regain my grip on reality, all the while dealing with some pretty heavy family and business stuff, weaning myself off bean-based brewed stimulants, and catching precious moments of shut-eye whenever the opportunity presented itself. 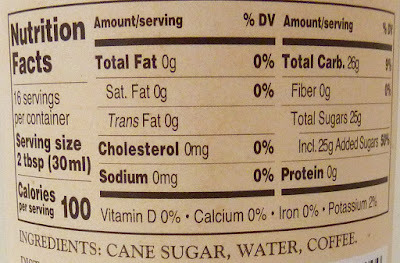 Sometime during that java-driven haze, I became vaguely aware of this coffee syrup's existence. Neither my body nor my mind could have handled such a product at that juncture, so we steered clear of it last spring. By the end of the summer, according to multiple online reports, this product had been discontinued. Part of me was relieved, as the pressure to review such a dangerous substance had been lifted. I didn't want to fall off the wagon so soon and return to my caffeinated coma for many more months. But another part of me pined for the opportunity to taste a product that by many accounts was not only one of the best offerings of Trader Joe's 2017 coffee craziness, but perhaps one of their greatest coffee products of all time. Well, friends, Trader Joe's Coffee Syrup is BACK, and IT. IS. HEAVENLY. It was prominently displayed on the "new products" shelf at the Wilmington, Delaware store. Nothing but cane sugar, water, and coffee. And that's all it needs. 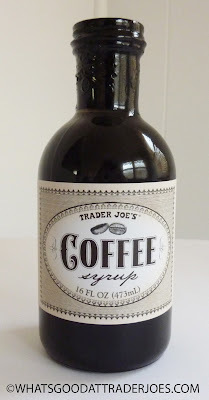 Yeah, sure, there are other coffee syrups out there...and likely one of them is Trader Joe's third party supplier, though I couldn't tell you which one. And I certainly can't vouch for those other brands, but I can tell you that this stuff is divine. It pours like a maple or agave syrup, though just slightly thinner. The thinness makes for easy mixing with milk, coffee, or your beverage of choice. It's still thick enough to make an excellent ice cream topping though, and the flavor blends seamlessly with vanilla. I tried a spoonful straight. It's got a strong coffee flavor just by itself, but it's also very sweet. I imagine it's not unlike a spoonful of Cold Brew Coffee Concentrate with equal parts liquid cane sugar mixed in. And yes, if one were so inclined, he could drink this stuff straight out of the bottle, though few would find the intensity pleasant after a sip or two. I'm not even really a "coffee guy," as I've stated many times on this blog, but I must say this is quite possibly the best-tasting coffee item I've ever sampled in my life. My mochaphile wife was even more impressed. She's not only in love with java, but she appreciates many coffee-flavored treats and desserts as well. Up to this point, her favorite coffee-flavored dessert has been Haagen Dazs coffee ice cream—and she's in awe of this product's ability to approximate the flavor and quality of the Haagen Dazs offering when combined with vanilla ice cream. In this case, we used Humboldt Organic Vanilla, readily available at TJ's in our area. Sonia and I haven't added anything to the Pantheon in nearly a year and a half, so it's high time we bestow that honor once again. Five stars from Sonia. Four and a half from me. Thank goodness it's not discontinued! I've had a bottle of this stashed in a dark corner of our pantry because I feared I'd never get any more. Besides drizzling it on ice cream, we use it to make coffee milk, and I even tried using it to make coffee soda with my Sodastream. That was not terribly successful, though. Coffee soda sounds so promising...maybe if you added some directly to seltzer water or tonic? I also have one of these stashed away from last year. I bought one every time I went there until they were gone and I was down to one. So glad it's back. 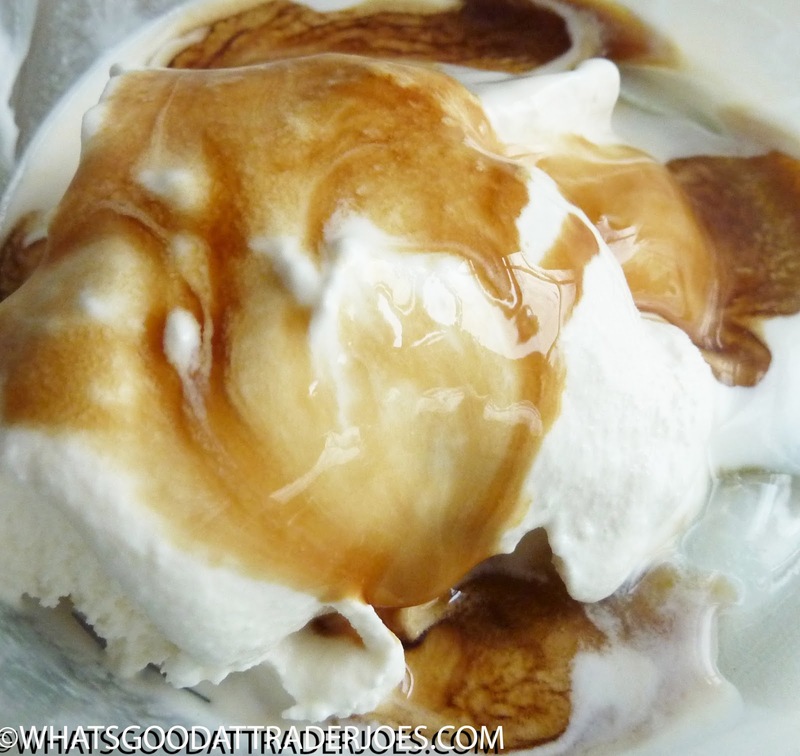 Great for coffee milk, coffee float with cola or seltzer and ice cream. Love it! Coffee float with cola, eh? I'll check it out! When this was out before I used some of it to make dark chocolate coffee brownies. I used a box of Ghirardelli dark chocolate brownie mix & added some of the coffee syrup to it. I was trying to mimic Trader Joe's Sumatra chocolate brownies. They turned out really well.